Your web site plays an important role in your overall digital marketing plan. 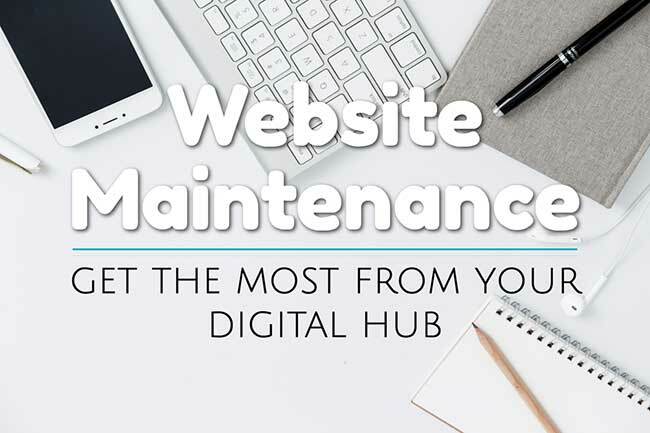 But many business owners don't realize that there are several maintenance steps that should be addressed on a regular basis to keep your site performing at its best. Below are the areas you should consider when putting together your maintenance plan. Just like we need regular checkups, it's good to have your website looked at by the foremost authorities on website health, Google and Bing. They both crawl and analyze your site on a regular basis on the lookout for any potential problems. They can alert you to any indexing issues, identify if a bad competitor pointed hundreds of poor quality links to your site, or if your site was hacked and infected with some type of malware. In addition to potential problems, Google & Bing's tools can provide you with insights into what is important to them for getting high rankings. Then you can plan to begin implementing those things moving forward to keep you ahead of the game. For example, when Google introduced its' pagespeed tool we deduced that the load time of a page was becoming an important ranking factor. ‍The content on your website acts as your 24/7/365 sales person. So, you'll want to review that content on a regular basis to assure that you are providing accurate and engaging content to your visitors. If you have a large website, setting up a content review schedule might be a helpful, systematic way to make sure it all gets covered. Be sure to check your internal and external links on each page as well to make sure none of them are broken. Links can become broken when you move or rename a page on your site, replace images or videos, or link externally to a page that is no longer there. You can use Screaming Frog to automate this process. The free version crawls up to 500 pages. When you find outdated content be sure to update that content as quickly as possible either by logging into your content editor and making the change yourself or sending your updates to your webmaster to make them for you. The way that you can help to show your subject knowledge and improve your online visibility is to create fresh content articles for your website. These articles allow you to address current topics in your industry and keep you relevant to your customers and the search engines. Your site analytics will show information like the number of visitors you are getting and where those visitors are coming from. This data helps you keep an eye on the pulse of you web traffic from paid, social or organic sources. Then once those visitors arrive at your site the analytics will track where those visitors are landing, the traffic movement through your site, and where your visitors exit your site. This information can provide important clues about the effectiveness of your content, page by page. If a page has a high bounce rate or exit rate, perhaps it is not answering the questions your visitors are asking. If a page is getting a lot of attention and engagement (visits, shares, conversions, links, etc.) it will help you know what content is important to your customers. It's good to know how your website is ranking on the search engines because they can drive a lot of relevant traffic to your business. Don't forget to check long tail keywords. If your site isn't appearing on the first page of search results for your keywords you may want to consider starting search engine optimization and search engine marketing for your business. This can help to improve your sites ranking position and in turn, drive more traffic to your site. Contact forms provide direct lines of communication between you and your customers or potential customers. It is critical that these forms work properly so testing them on a regular basis will allow you to discover any issues that may hinder that communication. I recently had a client who had an email system update that began blocking the form submissions being sent to her. The forms were being seen as spam by the email system and redirected them to a spam filter. After about two months of not receiving any forms she decided to test it and realized she wasn't getting them. It was corrected by adding the form sending address to a whitelist on the mail server. Modern, responsive websites will reformat their layout to display properly on different devises. But as content changes, browser versions are replaced, and scripts are updated it can cause one or more of the layouts to display incorrectly. This can create an embarrassing situation for a business and make them look unprofessional. (8) Manage Your Domain NameYour domain name is a valuable asset to your business and we strongly recommend that you keep your domain names in your control within your account. Some internet marketing companies like to register and control clients' domain names which can be helpful to the client but can also result in holding the client hostage if they want to discontinue doing business with the company. Be diligent in keeping your contact information updated within your account so that you can receive any communications from your registrar related to renewals or transfer requests. We recommend that you register your domain names for 5-years or more and that you set it to auto-renew when that time rolls around. Be sure to keep your credit card up to date with your domain registrar. If your website is built on the WordPress system, it is vital to have your system and plugins updated regularly. WordPress is an "open-source" software system which means that anyone can use, study, change and redistribute its source code. This is one of WordPress' strong points because it allows for developers to create additional functionality for the system but it's also one of its' weak points because hackers have the same access to the code. Regular updates are released to help patch any security vulnerabilities, but they only take effect if they are installed. As a precaution when getting ready to install system or plugin updates, always backup your site so that you can undo the update if it causes a conflict with the system or other plugins or if it just doesn't work properly. It is always a good idea to run automated backups with a WordPress website. If your site crashes, or it gets hacked or you do something to break it, having good backups to restore it can save a lot of time and money for a business owner. It's an understandable best practice to follow. Having a good maintenance plan in place and following it will keep your website in tip top condition and performing it's best for your business. If you need help with maintaining your website, we can do that for you at a reasonable hourly rate or put together a website maintenance package/plan to take that load off your shoulders.